Time has been kind on the fourth-generation Toyota Prius, as the extroverted styling means it still stands out. However, it doesn’t change the fact that it is now three years old, so Toyota has given its bread-and-butter hybrid a timely facelift. On the outside at least, the tweaks have made the new car slightly less polarising than before. Gone are the shapely arrow-shaped headlights, replaced by sleeker, slimmer units, while the nose has been raised for a more dynamic profile from the side. The tail lights no longer stretch so far down; instead, they are now wider and encroach into the tailgate. The rear number plate recess also gets a trapezoidal shape. Inside, the changes are more minor and consists of the optional Tesla-style 11.2-inch vertical centre touchscreen from the plug-in hybrid, as well as small revisions to the centre console layout and dashboard controls. There are also new cloth upholstery options, turn-by-turn navigation directions on the head-up display and a larger wireless charging tray to match the increasingly larger smartphones we use today. 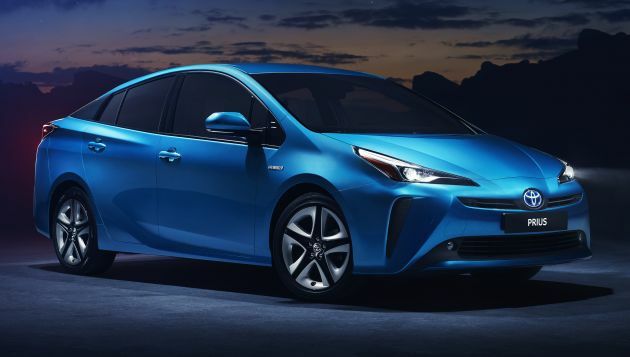 The single biggest change, however, is mechanical in nature – the Prius is now available with an electric all-wheel drive system that features a separate high-output motor to drive the rear wheels. It engages automatically when pulling away up to 10 km/h, and in low-grip conditions will operate at speeds of up to 70 km/h. If you’re thinking it’s identical to the E-Four system found in Japan then you’re right on the money. On the AWD variants, the battery is nickel-metal hydride; the standard front-wheel drive Prius, meanwhile, gets the existing lithium-ion battery as standard across the board (European models previously used a Ni-MH battery). The rest of the powertrain remains the same – a 97 hp/142 Nm 1.8 litre Atkinson-cycle VVT-i petrol engine paired to a 71 hp/163 Nm pair of electric motors delivers a total system output of 121 hp. The front looks like kucik meow cunning face, cannot get used to it…. the rear has some resemblance with CHR rear look, ok if it comes with LED feature. Front fascia looks okay already, when see the back… what a disaster!! X70 is not EV why compare? His Rush prospects all gone to book X70. This troll now has a deep hatred of anything X70, regardless of relevant or not. Toyota designer try so hard to adapt 2999 year looks and transform into 2018 year. Strange for us but looks good for people in the future.